If there is one thing Montreal truly does right, it’s food. I am in desperate need of a detox after exploring the mouth-watering Montreal food scene (no, but seriously– since we’ve gotten back I’ve bought a ton of fresh fruit and I’m working on eating as raw as possible to recharge my insides!) I’ve always been a big believer in indulging on vacation and needless to say, we did this past weekend. We hit Montreal’s foodie hot spots for poutine, a traditional French-Canadian dish, and for a warm sesame seed bagel with butter. We also went out for sushi, burgers and a classic brunch. Our food extravaganza brought us to various neighborhoods in the city from Old Montreal, to Downtown, to Le Plateau and Mile End. Here’s a quick look of where we ate over the weekend. Be sure to scroll down for some more in-depth reviews of my favorite places! Le Robin Square– By the time we got settled on Friday evening, it was nearly time for dinner. We ended up heading over to Le Robin Square in Old Montreal, which is the #2 restaurant in Montreal according to Yelp (#5 on Trip Advisor). These rankings are beyond well deserved. I was a little hesitant at first due to the interesting decor, but my dish was easily one of the best meals I’ve ever had in my life. Ben and I each got “Our Incredible Mac and Cheese” and it was phenomenal. It was sweet and creamy, but not overly cheesy. The ham was outstanding. Mixed together, it was heavenly and quite frankly, the best comfort food I’ll probably ever have. They described it as “Christmas at the Robins” and if that’s how the Robins celebrate the holiday, I may be knocking on their front door this Christmas season. What really stood out to me about Le Robin Square is the fact that the restaurant is a true local, family owned and both family and friend operated spot. As the name suggests, the restaurant is owned by the Robin family. The owners and the chefs all went to culinary school together and the waitresses on the floor that evening, who are actually sisters, are long-time friends of the Robins. All of the food and beer are locally sourced, which is a great feature– I always enjoy eating at places that support local businesses. The staff was so genuine and the atmosphere was so cosy that I felt like I was at home among close friends. I would highly recommend giving this restaurant a try. Do note: they don’t take reservations, so you may have to wait. We waited around 15 minutes after arriving at roughly 6:15 PM. There was was a line out the door by the time we sat down and there’s hardly any waiting room inside the restaurant. La Banquise – Essentially, the original “disco fries” for my New Jersey readers. 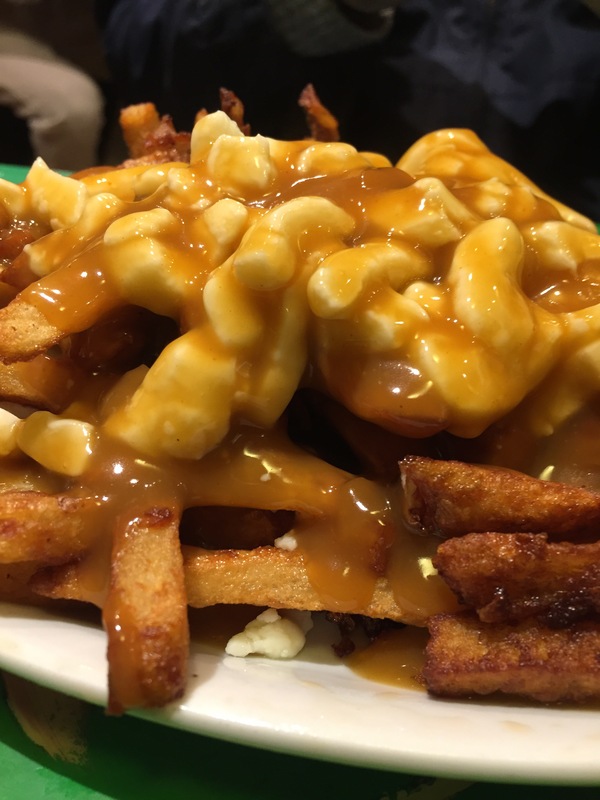 Feast your eyes on what is supposedly Montreal’s best poutine. I knew we had to try some authentic poutine being that it’s a traditional Canadian dish. It’s definitely a scary sight (I feel like just looking at it could cause your arteries to clog), but it was DELICIOUS. Ben went with the classic poutine and I, of course, got a loaded version that was topped with sour cream, bacon, swiss cheese and scallions. I feel like it was basically a super greasy, third cousin to a classic loaded baked potato. We had to wait about 40 minutes in the rain to get in to La Banquise, but it was worth it for both the grub and the whole experience. We truly lucked out: we were really hungry and growing tired of waiting, but just as I pulled up the map of the area, a hostess came outside in need of a party of two. Bingo! This joint, which actually has a much larger menu consisting of burgers and other items, is open 24-hours. Poutine-a-palooza! 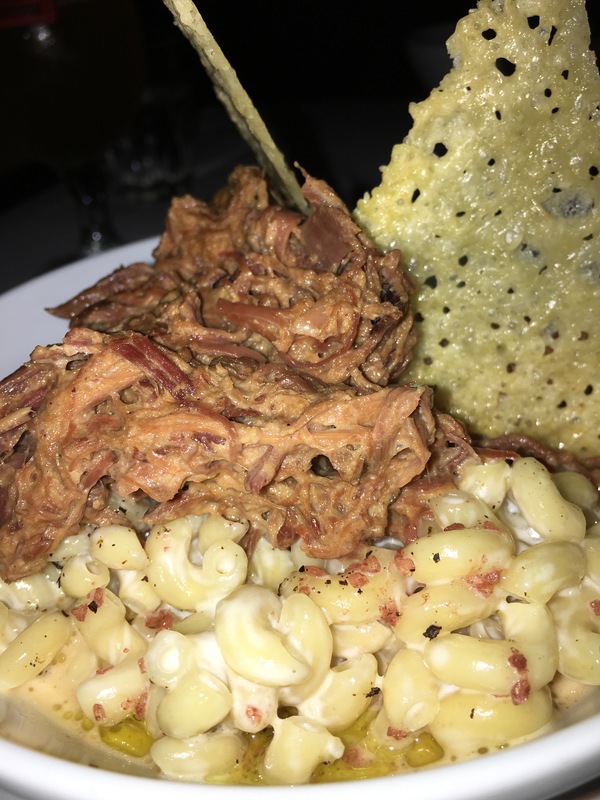 Check out some more from our lunch at La Banquise here! 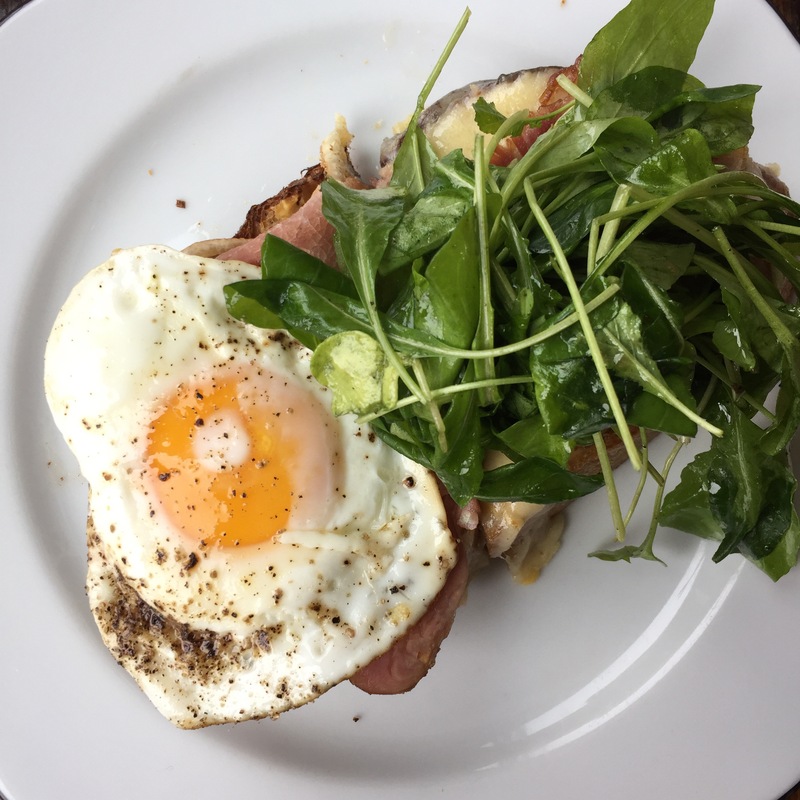 Lawrence – We ended up at Lawrence after seeing a line out the door at our first choice in Mile End, Faberge. There was a 30 minute wait at Lawrence, but rather than standing in line outside like the Faberge hopefuls, we passed some time with cups of coffee and hot chocolate at Larry’s next door. Lawrence had a tiny, but solid menu that had both conventional and unique options. Ben got the smoked salmon and scrambled eggs and I got the ham, cheese and fried egg on toast. I didn’t get to sample Ben’s salmon, but his eggs were scrambled to perfection. They were light, fluffy and cheesy. My open-faced sandwich was to die for. The egg may have been slightly over-done, but that didn’t stop me from devouring this breakfast masterpiece. The ham was great and there was a little bit of mustard on the toast, which gave the meal a nice kick. I liked how the dish came with some leafy greens. That was probably the healthiest thing I consumed all weekend. See more from our brunch at Lawrence here! 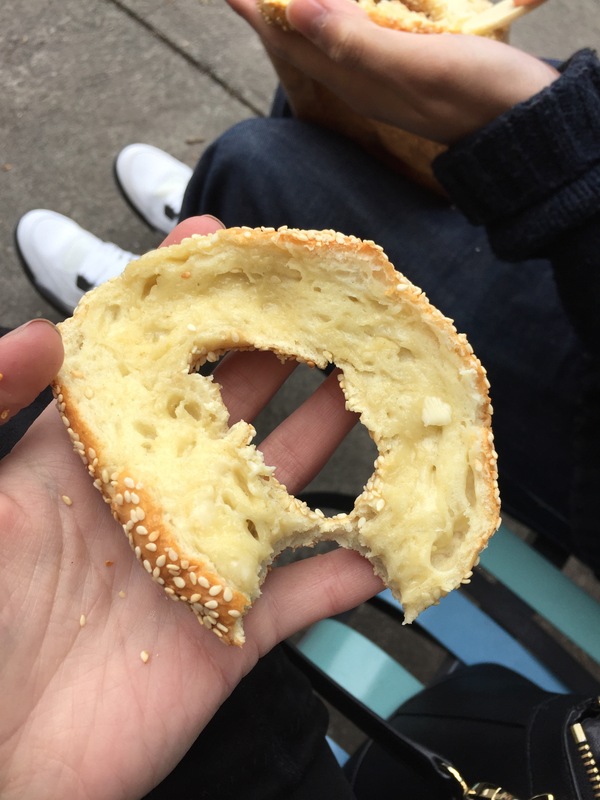 Fairmount Bagel– While I can’t give a unbiased opinion as I didn’t get to try the bagels at St. Viature or Bagels, Etc., I can say that the bagels at Fairmount were delicious. As I mentioned in my first post about Montreal, there’s a huge bagel turf war in the city between Fairmount Bagel and it’s nemeses St. Viature and Bagels, Etc. That’s three places specializing in a simple circle of dough with a whole in the middle all vying for the top spot in Montrealer’s hearts. Montreal bagels are definitely a lot different than the bagels one would find in the tri-state area. They’re smaller (unfortunately), sweeter and handmade! Having already eaten brunch, we didn’t need an entire bagel, so we split one just to try it. Like I said, the bagels are really good and there’s no denying it (every other customer in the shop was buying 2 to 3 dozen each! ), but I like how big and fully my favorite NJ bagels can be! No matter what your opinion on bagels may be, you should definitely make your way to Mile End to experience an original Montreal bagel! You won’t be disappointed. Tommy– My first reaction upon walking into Tommy for the first time: ‘is this real life?’ If you check out some of my other pictures of this magnificent coffee spot, you’ll understand why. I’ve never been to such a beautiful cafe in my life and while I’m sure there are various contenders in NYC, it’ll be hard to top. Located across the street from the Notre Dame Basilica, Tommy is a two floor coffee shop with huge windows, high ceilings, stunning moldings, floor-to-ceiling mirrors and an amazing plant with leaves that cascade from the hanging bed. After doing some research, it turns out that the owner of Tommy was inspired by coffee shops in Brooklyn! Despite being so extravagant looking, I couldn’t help but feel really cosy at Tommy. You could tell that while it attracted a fair share of tourists thanks to it’s prime location in Old Montreal, it’s definitely a local hub where city dwellers could catch up with a friend over a cup of coffee or settle down with a laptop to get some homework done. We saw both. Thankfully the coffee and treats were as amazing as the ambiance. My americano was really strong, which I liked, and my latte was great. We also tried both a croissant and a pumpkin pastry, which were delicious. I ended up getting breakfast there on our last day and my peanut butter toast with fruit and nuts was delectable. I’ll definitely be trying to re-create it! Tommy is a must if you’re visiting Montreal. Omg they were so good! I love eggs and could eat them literally every day. This was such a great brunch!! Well, then the pictures does them justice, cause they made my mouth water!